I know that Guy Fieri and Food Network's "Diners, Drive-Ins, and Dives" crew have been in the Twin Cities on more than one occasion. I've seen Al's, Mickey's, and others featured on the program. They're back in town. I spotted the film crew twice in the span of three days this week....once at the Town Talk Diner, and again two days later at The Wienery. I was sitting inside at The Wienery counter when I took this photo. My bratwurst (served Warsaw style) was nothing to sing about, sadly, but my french fries were spot on. Prolly shoulda ordered a wiener! The Wienery has a few tables, a diner-style counter with stools, and a beat up piano in the corner. Not much room for a film crew. Plenty of room to eat a wiener. 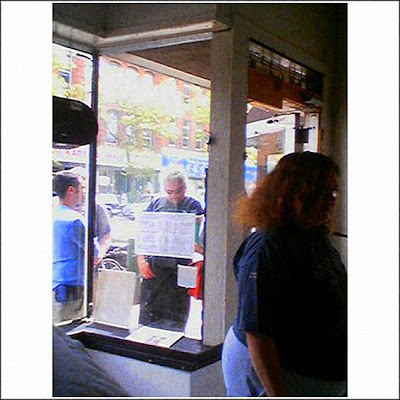 Guy's right hand lady asked Pat Starr, of The Wienery, to bag up a Hot Italian sammich for Guy after he read the menu taped to the window. I took this photo as we were leaving. Not pictured: the black stretch limo next to the dude in the black tie. That's right - a limo parked outside of The Wienery! FANCY! A big up yourself to my colleague, John, for the invite to The Wienery. PS - I heard from one of the handsome servers at the Town Talk Diner that the episode would be aired "sometime in July?" Also spotted at the Modern in Northeast! I was also at the Wienery that day for lunch and happened upon the crew. After the initial shock of the host's 'hip and in your face' appearance I decided to hop on the big multi person bike for my 3 seconds of fame. Alexis - The Modern? Is it considered a dive? Or were they just there to enjoy the pot roast? clove - what did you order? YEP! still a dirty and filthy dive. out of sauerkraut, coleslaw, cheese, no ice, leaking glass, all of the chairs ripped up with padding hanging out. Our orders were missing ingredients. You will wonder at some point whether you're going to get sick from the food or the atmosphere. Ahhh... just stay home!